I’ve moved the sale of my booklets over to Etsy! If you’re in San Francisco, you can still get them at Green Apple Books or Omnivore Books, but if you’re not in SF, head over Etsy! Pop-Up Pies: This Thursday, 4-6! Celebrate Donna’s move from her brick & mortar Pot+Pantry to a new online shop! Champagne will be flowing and I’ll be hawking sweet & savory pies as well as my recipe booklet. She’ll be discounting everything in her shop 30%. This Thursday, March 21st, from 4 to 6 pm or until I sell out (the store will still be open, and there might even still be champagne after the pies are gone…). Whew, say that 5 times fast! The amazing Donna of Pot + Pantry is shuttering her brick & mortar shop and moving to a soon-to-be new online shop on March 24th (read her newsletter here). Everything in her shop is 30% off, and she’s even selling the super rad fixtures (and maybe if you ask nicely she’ll sell the rad Le Creuset piñatas that she handmade). 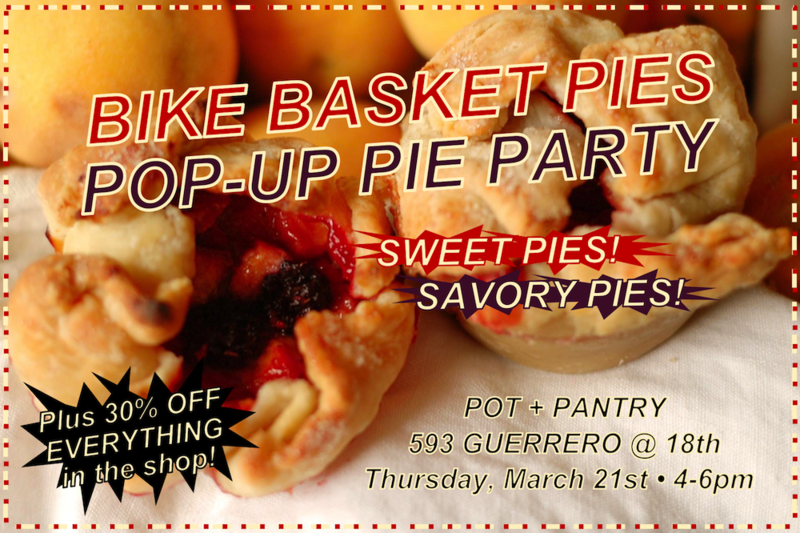 To sweeten those deals, I’ll be selling pies at her shop on Thursday evening, March 21st. Time TBD, but expect early evening. I’ll have savory, sweet, and recipe booklets for sale. I’m coming out of “retirement” for one-night! Pies’ll be $4 a pop. This probably won’t happen again, so I hope so see you Sunday! Evelyn Lee is at Mariposa & Potrero, and it’s a bar so it’s 21+. The November pie dough class sold out so quickly and was such a success we’ve decided to host another one (or two!). The next class will be Wednesday, December 5th, at Pot + Pantry from 7 to 8:30 pm. We’ll start by eating fresh pie and discussing the differences between butter, lard, and shortening crusts and the advantages of using different liquids. I’ll share all of my dough-making tricks. Got a question about making the perfect pie? This is the time to ask! After that we’ll all make our own pie dough. The class size is limited to 10 people so you’ll get lots of attention. The $40 fee includes all of the ingredients, the dough that you’ll make in the class, a Bike Basket Pies recipe booklet so you know what to do with that dough, and a pie dough blender so you can make more at home! *Pot + Pantry is a wee boutique in the Mission specializing in new and secondhand kitchenware, founded by Donna Suh in 2010. It was named the Best Kitchen Shop by 7×7 Magazine, Top 100 SF shops by the San Francisco Chronicle, and has been featured in Food & Wine Magazine. Learn how to make an amazing pie crust with me! I’m teaming up with Pot + Pantry to host a pie dough class next Thursday, November 14th. 14 seasonal recipes, adorable illustrations by Minty Lewis, and it’s printed in SF on recycled paper. Buy it online, or pick it up from a few local San Francisco businesses. I’ve been working with a good friend of mine to turn the booklet into an iPhone/iPod application, now available for download from the iTunes app store. The app includes Minty Lewis’ illustrations and is, of course, a very lightweight way to bring the booklet with you when you’re shopping for ingredients, or when you’re headed out of town and want to make pies with your less-than-local friends and family. Once you’ve checked out the app, please consider reviewing it! And of course – you can still purchase the booklet at a number of local San Francisco shops, or buy it online here and have it shipped directly to your door. Wow – I’m completely out of booklets! It’s so exciting to see how interested people are in it. Anyways, I am in the process of getting more printed and any booklets ordered between now and Monday, December 19th will be shipped on Tuesday, December 20th. Due to personal holiday travel, *NO BOOKLETS WILL BE SHIPPED AFTER DECEMBER 20th. * Any orders placed on the 20th or beyond will be shipped after December 25th. But! Some good news: a handful of amazing local shops in San Francisco have the booklet in stock. Even if you already have the booklet, you should check these shops out. 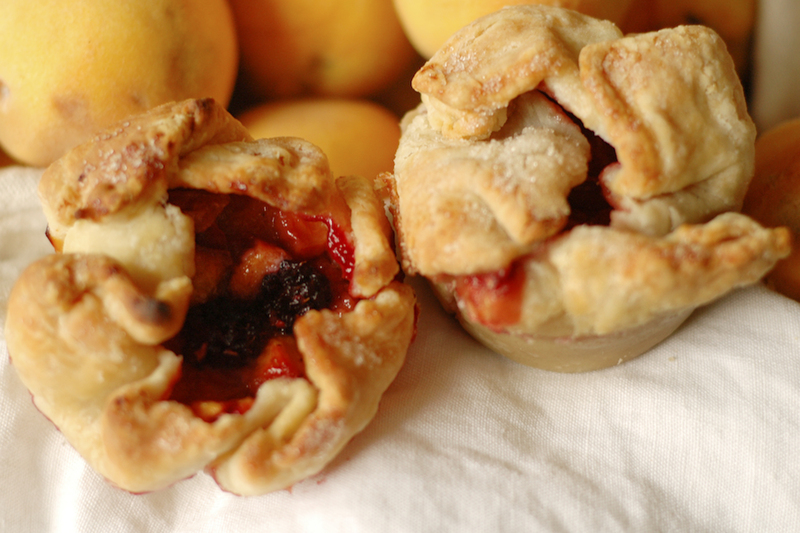 I have begun taking pre-orders for Bike Basket Pies: How to Make Pies for Bicycle Delivery. 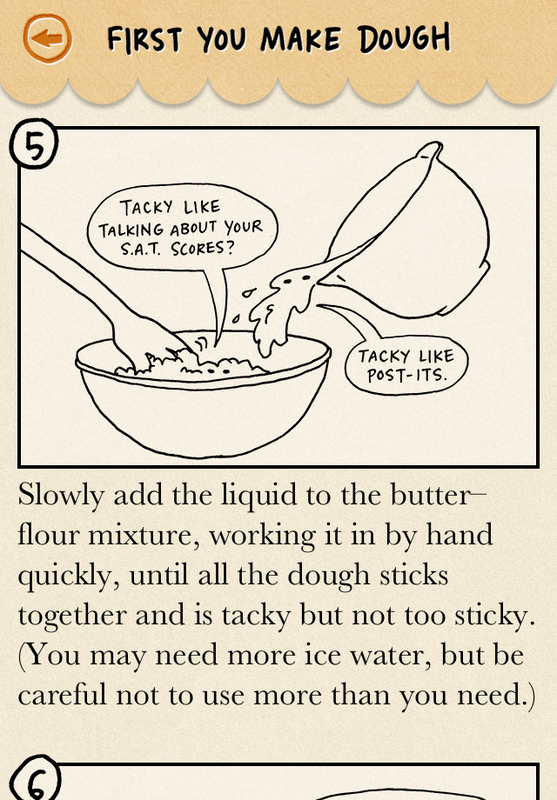 The booklet includes 14 pie recipes & tons of amazing illustrations by Minty Lewis. Each booklet is $12 plus a little tax & shipping. Additionally, a release party is set at Pot + PantryThe party is BYOPie – it’d be fantastic to celebrate the launch of the booklet with pies from friends and fans alike. what: BYO Pie! Champagne provided, Booklets for sale. More details about the booklet and about the party on the booklet page.